This months new recipe, Crunchy Squirrel Dog Biscuits, was made specially for National Squirrel Appreciation Day, January 21st. Squirrels provide entertainment and excitement for our dogs. They allow our dogs the needed opportunity to hunt, chase, bark and run. Although they can sometimes be a nuisance, squirrels provide beneficial aeration of lawns and the planting of new tree saplings. 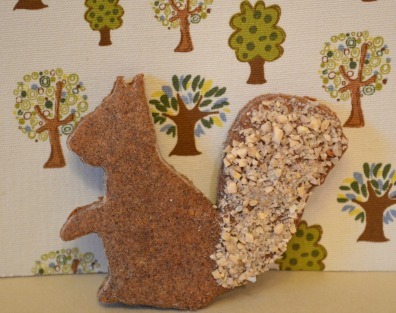 Allow your dog to "catch" these squirrels for a healthy and satisfying crunchy homemade dog treat. Are you ready to take your creative homemade dog treats out to the public? Then you must read my review of Bake a Dog a Bone - Turning Your Passion for Pets Into Profits. Have a fellow dog lover walk you through the process of starting your own dog bakery. This eBook can help you successfully take your homemade dog treats to dogs all over the country. The percentage of overweight and obese dogs continues to rise. Make any needed changes this year to help your furry friend be as healthy as possible. 1. Read the labels of your dogs food and commercial treats. Put forth the effort to really understand what is in the food, what should be there and in what quantity. 2. Dedicate 15 (or more) minutes each day to play with your dog. Brain teasers, like puzzle treat toys, or a good old fashion game of fetch, will be appreciated and beneficial for both you and your dog. 3. Have a brief visit to your Vet to see if your dog is at a healthy weight. If not, plan a new food management system with your Vet for your dog. 4. Take regular walks or visits to the dog park. You may be tired at the end of the day, but if your dog has been at home alone all day, she's probably bored. Bond with your dog on a daily walk. You'll be surprised how much better you both will feel. 5. If you and your dog are healthy, that is a blessing. Pass on the extra love to a dog in need by volunteering at your local animal shelter. Or, if you can't donate your time, donate a few extra dollars to help less fortunate dogs while they wait for their forever homes. "I took some of your doggie treats to friends' dogs and found out the people ate them too! Said they were wonderful." So, what are you waiting for? The critics have spoken, my recipes are loved by four, and two-legged, taste testers! Read more about all the features, like over 90 original photos, of my eBook 15 Easy Dog Treat Recipes with 5 Ingredients or Less!. "Thank you, I LOVE the treat recipes and so do my girls. All are always organic, of course :-)"
"Thanks so much for all you do to help us keep our canines eating healthy."